Over Christmas vacation, Jamie and I ate a lot of chocolate. Just before the holiday, I was shopping at Costco to replenish my supply of sugar, flour and butter, and happened to see a box of Belgian chocolates which I bought on a whim. And they were maybe the most amazing chocolates I've ever tasted - clean, dark, absolutely perfect. After we sampled a few, Jamie turned to me and said, "Okay, I'm going to need you to recreate all of these when they're gone." 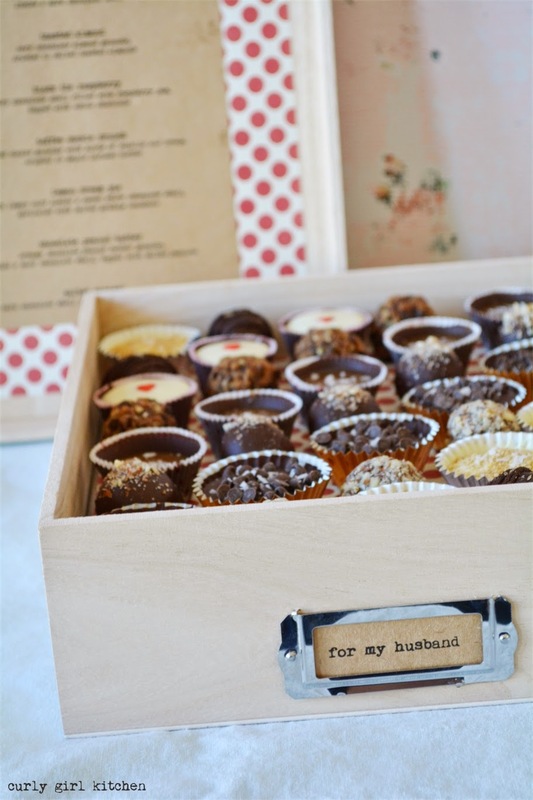 So for this Valentine's, I surprised him with a beautiful box of homemade assorted chocolates. While nothing will ever really measure up to that box of chocolates at Christmas, which were a little more complicated than I was able to replicate, I was still pretty happy with what I made. Perhaps it was a bit much for me to take on the task of creating not just two or three, but eight different chocolates, but really with one batch of ganache I could customize for each flavor and a big bowl of melted chocolate, it wasn't that difficult to make so many different varieties. They all look so lovely, but I think my favorite is the molten chocolate. When you bite into it, the liquid center of homemade dark chocolate syrup drips out, creating quite a mess, so that you're compelled to lick your fingers clean of every last drop. 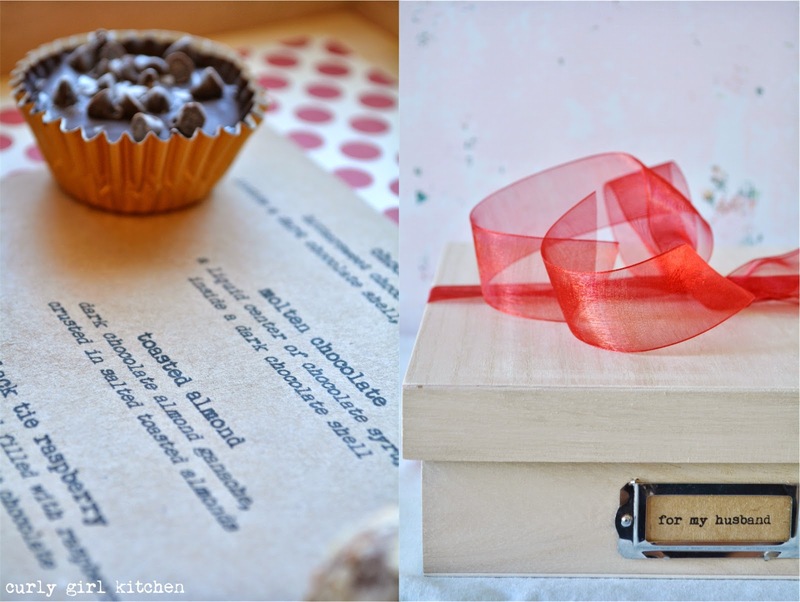 First, make and chill the ganache. You will need equal parts (by weight) of dark chocolate (either chopped chocolate or chocolate chips will work) and cream for the ganache. 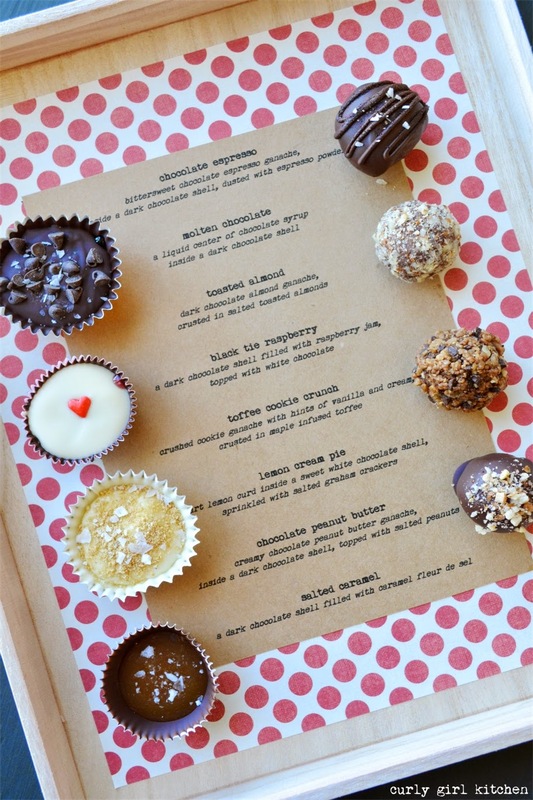 Start with about 8 ounces of each, and you can always make more if you want to make more truffles. Pour the cream into a saucepan and warm gently over medium low heat, just until the cream begins to bubble around the edges. Remove from the heat and stir in the chocolate. Let stand for 3 minutes, then stir with a spatula until smooth and shiny. Refrigerate for several hours, or overnight, until very firm. 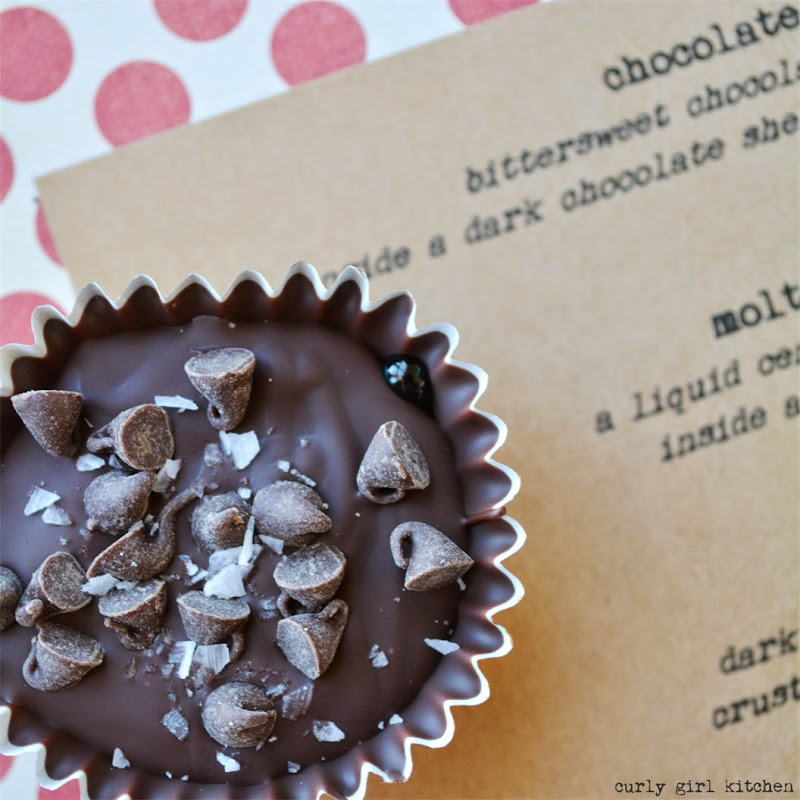 Keep melted chocolate ready by setting up a double boiler (fill a pan with several inches of simmering water and place a heat-proof bowl over the pan - the bottom of the bowl should not be touching the water). Melt the chocolate in the bowl and turn off the heat. If the chocolate starts to thicken up while you're working, turn the heat back on for a few minutes to thin it out again. 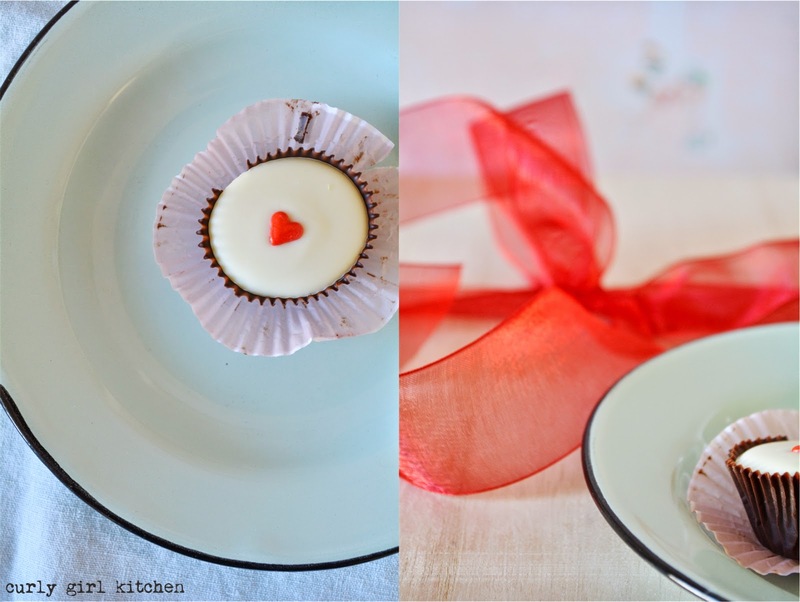 To make the molded truffles in the mini cupcake liners, spoon melted chocolate into the liners so that they're about 1/3 full. Tilt the liner around to let the chocolate coat the sides of the liners, then chill the chocolate shells before filling. 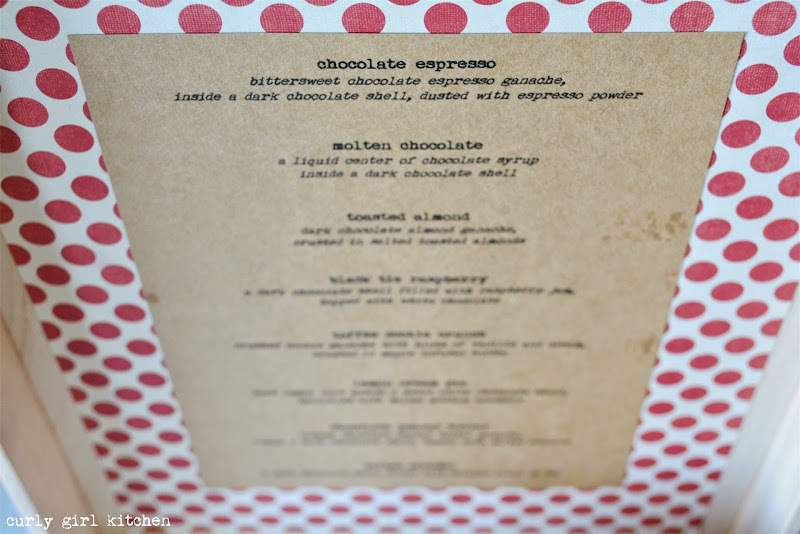 Mix espresso powder into chilled ganache, making the coffee flavor as intense as you like. Roll the ganache into balls and place on a parchment-lined baking sheet. Chill for a few minutes, then dip the ganache into melted dark chocolate, letting the excess drip off before you return to the baking sheet. Chill until firm, then drizzle with a little more dark chocolate, sprinkling with espresso powder and coarse salt before the drizzled chocolate sets. Toast some almonds; leave a few whole, and finely chop the rest, adding a little coarse salt to the chopped almonds. Add a few drops of almond extract to some chilled ganache. Roll the ganache into balls, with a whole almond inside each. Roll the truffles in the chopped almonds. Mix crushed cookies and a few drops of vanilla extract with chilled ganache, adding a little cream if the ganache becomes too dry with the addition of the cookies. 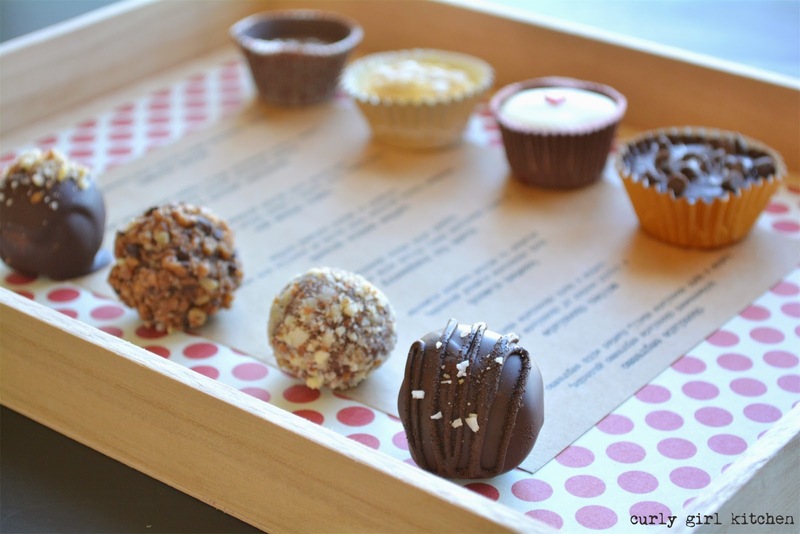 Roll into balls then roll each truffle in crushed toffee bits. Mix together equal parts of chilled ganache and peanut butter - I used an all-natural peanut butter. 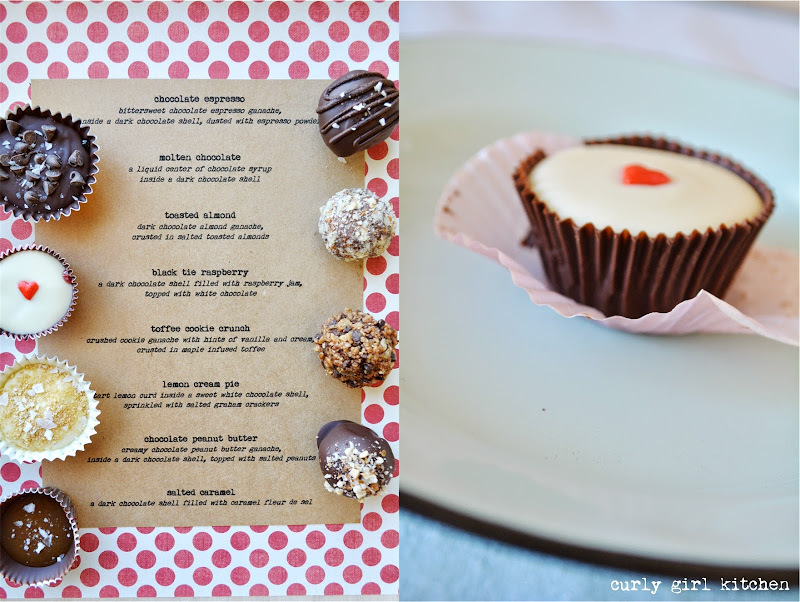 Roll into balls, chill for a few minutes, then dip the truffles in melted dark chocolate. Sprinkle each with crushed salted peanuts before the chocolate sets. 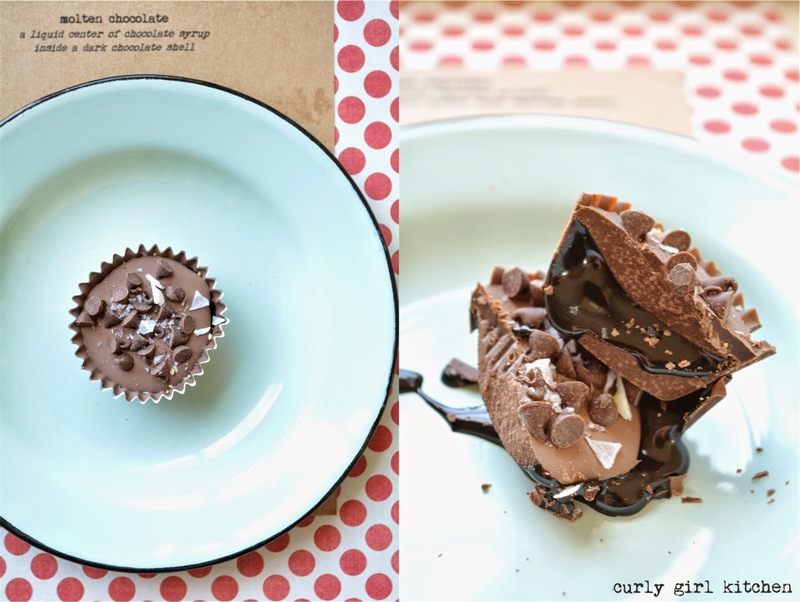 Create a chocolate shell in a mini paper liner and chill until set. Fill 2/3 full with dark chocolate syrup. Freeze until the syrup is firm, then pour melted dark chocolate over the syrup to seal the top of the truffle. Sprinkle with mini chocolate chips and coarse salt before the chocolate sets. 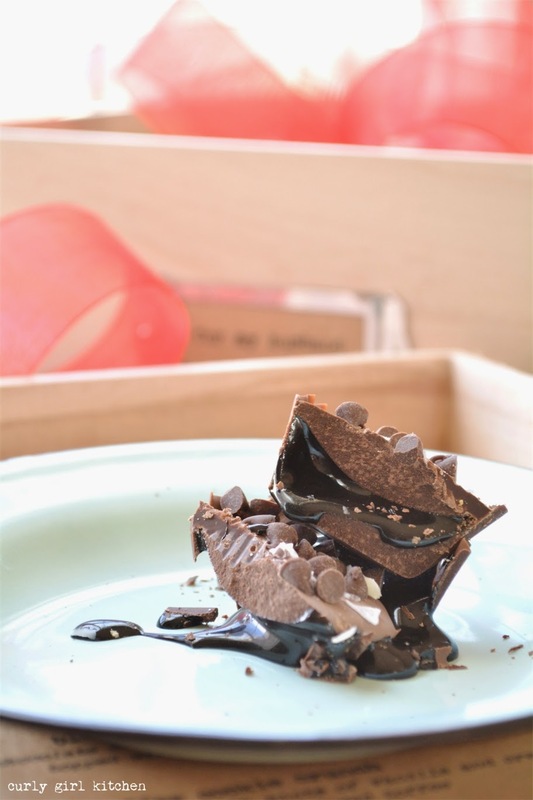 Create a chocolate shell in a mini paper liner and chill until set. Spoon about a teaspoon of raspberry jam into each. Pour melted dark chocolate over the jam, leaving a little room at the top, and chill until set. 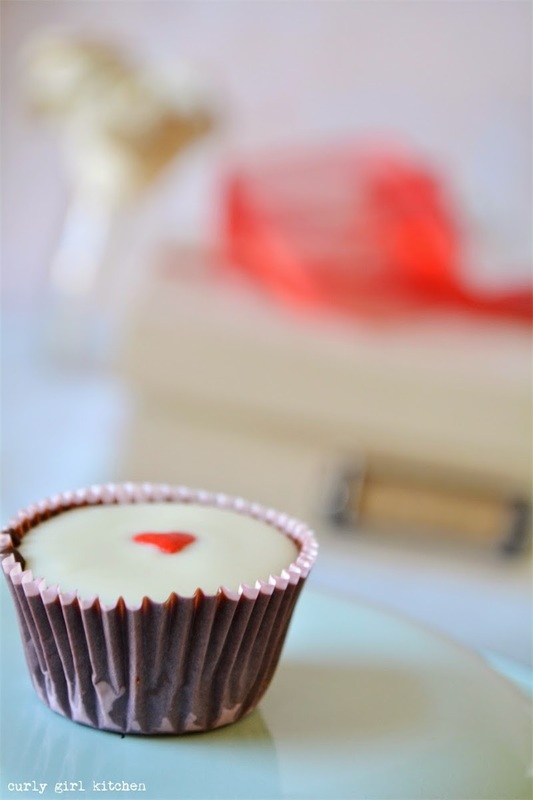 Pour melted white chocolate on top and add a red heart sprinkle. 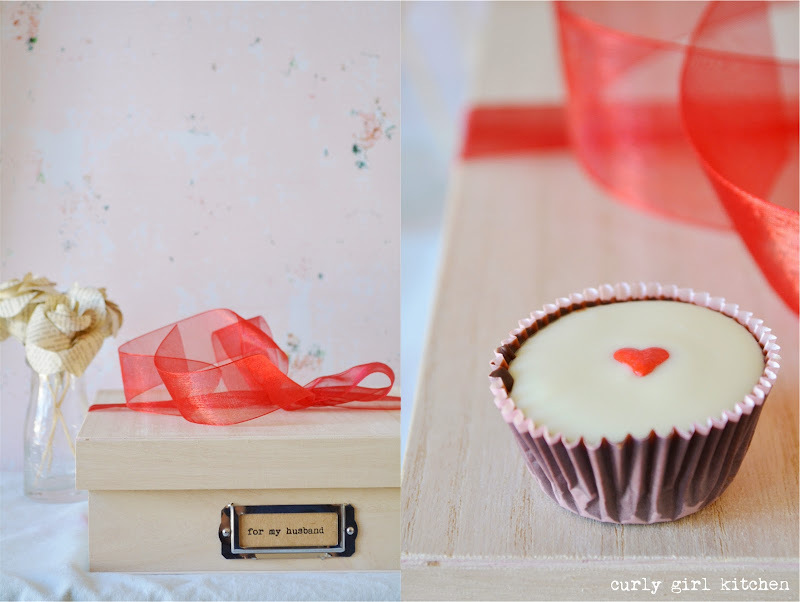 Create a white chocolate shell in a mini paper liner and chill until set. Spoon about a teaspoon of lemon curd into each. Pour melted white chocolate over the lemon curd and sprinkle with crushed salted graham crackers before the chocolate sets. 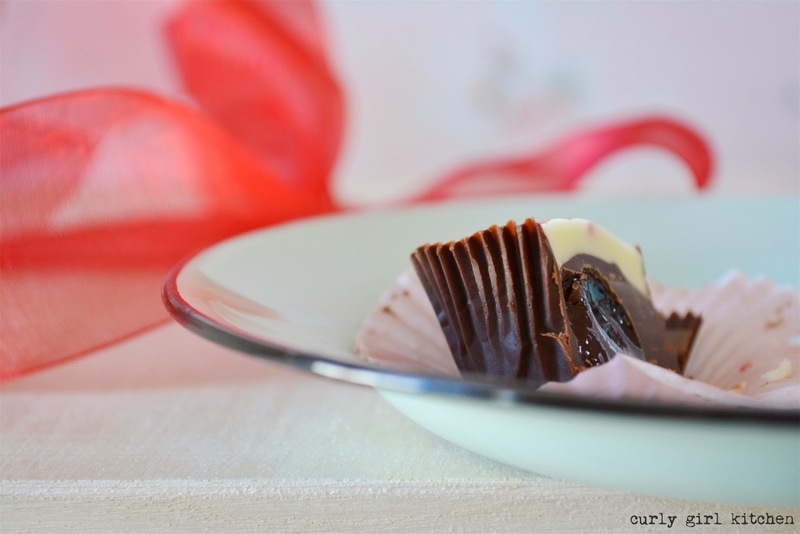 Create a chocolate shell in a mini paper liner and chill until set. Fill with salted caramel sauce and sprinkle with a little more coarse salt.